The cost of the purchase was $15,000,000. In whole or in part fourteen states and territories have been formed in the area which was bought. The French held Louisiana until the fall of Quebec in 1759. Four years later France ceded Louisiana to Spain. After the American Revolution the US boundary was the Great Lakes, the Mississippi, and the thirty-first degree. England had promised also the free navigation of the Mississippi. 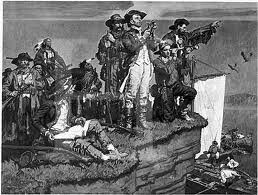 But Spain, holding the river’s mouth, refused to allow navigation on the Mississippi which cut off American access south. Napoleon regained Louisiana from Spain but the slave revolt in San Domingo and the prospect of war with England ruined his plans to develop Louisiana. President Jefferson sent Monroe as commissioner to Paris to secure New Orleans and the Floridas and make clear the way to the sea. The instructions of Monroe and Livingston were limited to a strip of seacoast. Instead, Napoleon offered them the whole vast area of Louisiana. 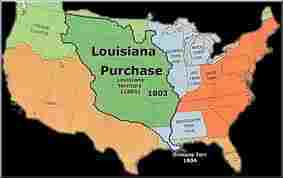 The United States actually acquired Louisiana from France even before possession had formally passed to France from Spain. The United States had acquired a wilderness. 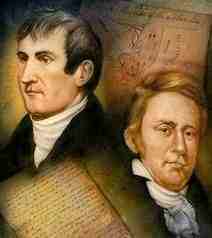 President Jefferson ordered Meriwether Lewis and William Clark to follow the rivers, map them, collect scientific data, and assess the resources gained throughout the Louisiana Purchase. On the first United States expedition (1804–1806) to the Pacific Coast the men were to find a “direct & practicable water communication across this continent, for the purposes of commerce” (the Northwest Passage). Jefferson also wanted to compete with the British for control of land and the fur trade.